In today’s world, receiving quality medical care is hard to come by and can be a very frustrating search, at best. Finding Dr. Brusovanik, who specializes in minimally invasive spine surgery, was a restoration of my faith in the medical community! His knowledge and professionalism is only surpassed by his personal interest, care and unique insight into his patient’s physical and mental challenges. He is an extremely proactive practitioner of the medical arts and his body of work, testimonialized by his peers and patients, is indicative of the care you also will receive. To make matters better, Dr. Brusovanik has surrounded himself with an amazing staff that are a true reflection of his positive vision. I’m a 33 year old, healthy, active male. Over the last couple of years I was experiencing chronic back and sciatic nerve pain due to a herniated disc in my lower back. The pain was excruciating and would not subside since my nerve was essentially pinched. Dr. Brusovanik explained to me in great detail all of my options and we agreed on a course of action to take in regards to my specific situation. Ultimately, I moved forward with surgery in December of 2013. I was never once concerned about my well being as I knew I was in great hands. Dr. Brusovanik treated me as if he were treating his brother or close family member. He followed up with me numerous times after my procedure and I also was able to contact him personally if I ever needed anything or in case of an emergency. Having that option was a very comforting feeling for me. The results speak for themselves – I followed his post-op instructions and was back to walking a few days after surgery. Fast-forward 7 months and I’m back to feeling almost 100% – working out and back to leading an active lifestyle. Each day when I wake up, I have Dr. Brusovanik to thank for being able to go about my daily routine in a normal fashion once again. Without a doubt, I would recommend Dr. Brusovanik to anyone who is experiencing issues with their back and/or neck. Spine surgery done the “classic” way is traditionally done with an open approach, meaning that the surgical area being operated on is opened with a long incision to allow full view and access to the anatomy by the surgeon. In the past recent years, there have been advances in technology that have allowed spinal conditions to be treated with the minimally invasive spinal surgery (MISS) approach. Any type of spine surgery is usually recommended after a period of conservative, nonsurgical treatment such as medications, physical therapy and injections have failed. 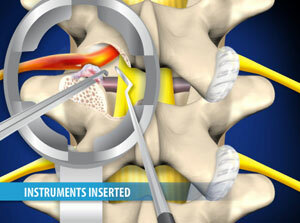 Minimally invasive techniques have been used for a wide range of spine procedures, and have been used for common procedures like laminectomy surgery and spinal fusions since the early 1990s. 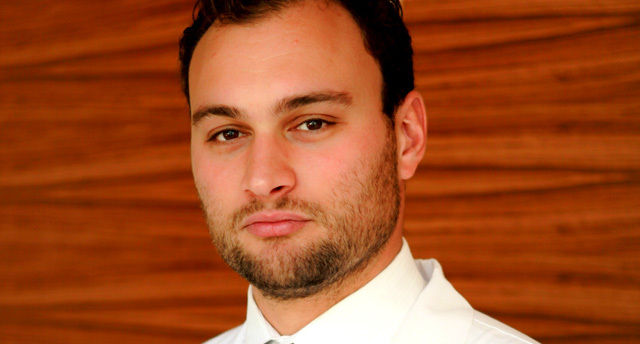 Dr. Brusovanik was educated in neurosurgery and orthopedic spine surgery and has been trained using the MISS techniques. One of the disadvantages of the classic, open surgery is the retraction or pulling of the back muscles and damage it causes to the soft tissues. As a result, there is a greater risk for muscle injury to the spine which can lead to a longer stay and recovery in the hospital due to pain. Minimally invasive spine surgery was developed to treat spinal problems with less injury to the muscles and structures of the spine. Since the MISS techniques include smaller incisions, the surgeon is able to see where the exact problem exists. As opposed to the open spinal surgical technique, MISS is safer and requires less recovery time and less rehabilitation. Since there is less or no muscle cutting, the risk of muscle damage is reduced along with postoperative pain, which in turn diminishes the reliance on pain medication or narcotics after surgery. Another advantage besides smaller incisions and shorter stay in the hospital are less blood loss during the procedure and reduced risks of infection. Since the surgical field is smaller, the surgeon usually uses 4 times magnification loupes or microscope with great lighting of the visual field to precisely correct the spinal problem. 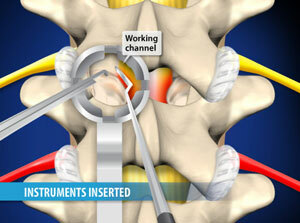 Minimally-Invasive Lumbar MicrodecompressionThis minimally invasive procedure is used to remove overgrown vertebral bone and soft tissue to relieve the compression of nerve roots in the lumbar spine. It is performed through a small incision on the back. Dr. Brusovanik and Dr. Mork help Mr. Robertson with an endoscopic decompression "Dr. Brusovanik and Dr. Mork help Mr. Robertson with an endoscopic decompression"